How many beads to you have in a maala? Why do saints (sadhus) prefix 108 before their name like Shri Shri 108..? And why is 108 given so much importance in religion in particular ? This is a common question that I am often faced with when people come to take my guidance. So I decided to search the answer in numerology and spiritualism. In numerology, number 1 is ruled by Sun, 0 by the power of Almighty and 8 by Saturn. Sun symbolizes the spiritual aspect of life. Saturn symbolizes the worldly and material aspect of life And almighty denotes perfection and salvation. Now a question arises why the number is 108 and not 801 or 180 or 810? · Ancient Indians were excellent mathematicians and 108 may be the product of a precise mathematical operation (e.g. 1 power 1 x 2 power 2 x 3 power 3 = 1 x 4 x 27 = 108) which was thought to have special numerological significance. · There are 54 letters in the Sanskrit alphabet. Each has masculine and feminine, shiva and shakti. 54 times 2 is 108. · The chakras, in human body, are the intersections of energy lines, and there are a total of 108 energy lines converging to form the heart chakra. One of them, sushumna leads to the crown chakra, and is said to be the path to Self-realization. · Marmas or marmastanas are like energy intersections called chakras, except have fewer energy lines converging to form them. There are said to be 108 marmas in the subtle body. · Some say there are 108 feelings, with 36 related to the past, 36 related to the present, and 36 related to the future. · There are 12 constellations, and 9 arc segments called namshas or chandrakalas. 9 times 12 equals 108. · In a horoscope, there are 12 houses and 9 planets. 12 times 9 equals 108. · There were said to be 108 gopis of Lord Krishna. · In the Jain religion, 108 are the combined virtues of five categories of holy ones, including 12, 8, 36, 25, and 27 virtues respectively. · Sikh tradition has a mala of 108 knots tied in a string of wool, rather than beads. · It is believed that Atman, the human soul goes through 108 stages on the journey. · There are 108 forms of dance in the Indian traditions. · There are 108 Upanishads as per the list contained in the Muktikopanishad . My search continued and soon I got the answer. According to Vedas, the universe was created by five elements: space, air, fire, water and earth. From these elements came the three attributes: Raj (birth), Sat (protection) and Tam (destruction or death). Perfection or salvation can be attained if there is a perfect balance between the three. Similarly, if analyzed, the number 108 contains 1 which stands for the birth, 0 stands for protection and completeness in spiritual practice, and 8 stands for destruction or death. 108 is actually the numerical value of almighty’s power of perfection. It signifies Radha and Krishna, Sita and Ram. I concluded this when I came across the phonetic values given by the great Mathematician Aryabhatta. 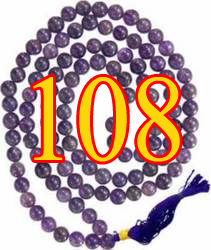 Substituting his numerical values of the alphabets in Radheshyam or Sitaram we get a total of 108. 108 symbolises a perfect combination of the social and the spiritual world. The sum of 108 is 9 which is the number of completion. In numerology I have observed that number 9 is a universal number and signifies completion and salvation. It is really strange but most of the human activities revolve round number 9 – a child normally takes 9 months in the mothers’ womb, we breath 72 times in a minute and so on. All the multiples of number 9 add up to 9 when each digit is separately added. This shows yet another characteristic of Number 9. Number 9 is the number that has the potential to absorb everything. All vices and good deeds are absorbed in it. Thus, I conclude that 108 is actually a number of ultimate happiness, perfect compatibility and everything in its perfect form. Writing or reciting a mantra 108 times makes it a complete series and helps the devotee in getting closer to God : the ultimate truth.